In large bowl, mix icing sugar, 1/3 cup flour and the cinnamon. Gently stir in peaches until coated. Spoon into crust-lined pie plate. In medium bowl, mix 3/4 cup flour, the brown sugar and cinnamon. Cut in butter, using pastry blender (or fork or pulling 2 table knives through mixture in opposite directions), until mixture looks like coarse crumbs. Sprinkle evenly over filling. Bake 40 to 45 minutes or until topping is golden brown. Cover edge of crust with foil after 15 or 20 minutes of baking to prevent excessive browning. 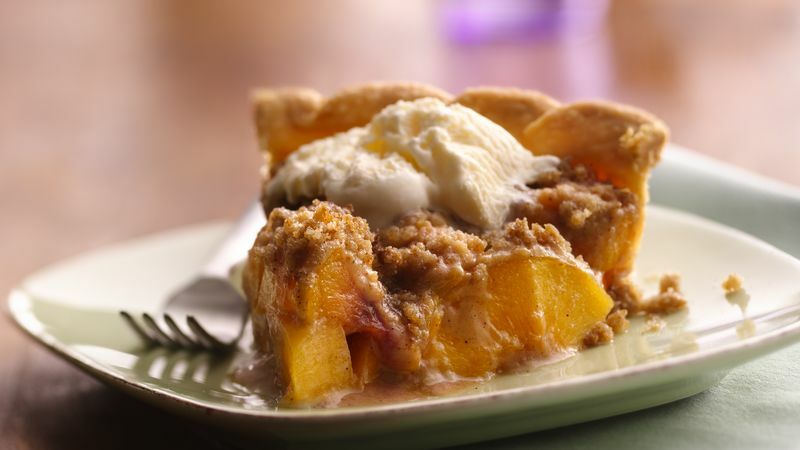 Streusel-Topped Peach-Blueberry Pie: Substitute 1 cup fresh or frozen blueberries (do not thaw) for 1 cup of the peaches. *Two cans (796 mL each) peach slices, well drained, can be substituted for the fresh sliced peaches.